I am sorry to fill up your inbox with yet another email from the LMC, but these is so much happening at present and following the GPC Road Show last week there is quite a lot of information to pass on to you. n. Partners vs Salaried GPs. P. New LMC Lunch and Learn - emergencies in general practice. The GPC Roadshow was held at the Ageas Bowl in Southampton last week. I am aware that in some parts of the country the attendance rates have been in the region of 50-60 GPs and Practice Managers. I am pleased to report that in Wessex, we were fully booked with 130 GPs and Practice Managers having reserved places and a further 30 people were on a waiting list. About 20 people who were booked to attend did not show on the night, depriving other people of the opportunity of attending. Please could I ask that if you are unable to attend a course you are booked on to or you decide you do not want to attend, please couold you let the LMC know so that we can offer the place to someone else. The LMC is very fortunate that the vast majority of our Conferences get fully booked and this often happens within a few days, please help us to help you. There is no doubt you will get more information by attending the GPC's Roadshow but I will try and give you an update on the key issues that were discussed. There are many issues that affect general practice that are currently being negotiated with NHS England and the Government that lie outside the Contract Negotiations. There will be minimal planned contractual changes for 2018/9, although the negotiations have yet to be concluded. There will be no changes to QOF (apart from uplift for CPI) – the review for 2019/20 is underway and will report back later this year. The GPC is seeking a commitment to uplift vaccinations & immunisations payments and sickness, maternity and paternity payments. There will be £30m uplift for indemnity for in-year rise in indemnity costs for 16/17 and £30m for 17/18 - i.e. there will be £60m available in this year to cover the increase in indemnity costs. This will be paid to practices on a per patient basis and not weighted. Practices should reimburse all GPs, the LMC would recommend that the amount received should be shared out to all GPs who work in the Practice whether they be Partners or Salaried GPs and this should be calculated by the number of sessions worked. The only exceptions to this is where the Practice pays the Indemnity costs of their Salaried GPs, clearly this group are not entitled to a share of this money and GP Retainers who receive a sum of money to cover expenses. Locum GPs will review their charges to reflect their costs, including any increase in indemnity costs. There will be published guidance and template letters will be made available to salaried GPs and locums to help them make sure they get appropriate reimbursements in the near future. The discussions have already started on State-backed indemnity scheme from April 2019. The Premises Cost Directions 2014 are outdated and we have been waiting for some time for new Premises Cost Directions, to address many of the issues that all GPs face, for example Improvement Grants, "last man standing" and one GP holding a lease, difficulty in bidding for funds for new builds etc. We are expecting the New Premises Cost Directions to be published shortly (I hope!). This should include the ability to receive 100% improvement/development grants, with limited liability. There should be explicit options for owner-occupiers who hand back core contract. The Board can waive grant repayment for leaseholders who hand back core contract and can assign a lease to their designated property body for leaseholders who hand back core contract. Lease terms will not be varied following a rent review. Practices will not be at risk of being financially disadvantaged by agreeing to host a third party at the request of the commissioner. A “Focus on premises cost directions” guidance document to be released alongside new directions. Finally the GPC England calling for “premises commission” to look at wider issues and future arrangements. The NHS Standard hospital contract changed such, that from October 2018, hospitals will not be paid for referrals unless received through ERS. We are already experiencing hospitals who are saying paper referral will be returned and a "paper switch off date" has been stated before October 2018, the LMC has been working with various areas on this issue and has largely managed to resolve the problems. Hospitals must reply to the referring GP and not sent to the retired Senior Partner. There should be joint guidance on ERS including how responsibility/liability flows through the system. 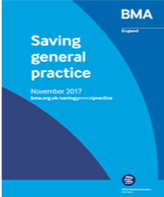 The document is attached, this was published at the end of 2017 and follows on from the urgent prescription for General Practice - click here for document. The GP share of the budget in 2006 was 9.6% and this fell to 7.4% in 2013/4 and is currently 7.7% and needs to be closer to 11%. The GP Forward View commits to an additional £2.4bn recurrently by 2020/1 - but this must be real funding and it must be invested in such a way that it has a positive impact on the workload in general practice. 5,000 more GPs a myth or a reality? The Secretary of State announced state-backed indemnity scheme for all GPs and practice staff from April 2019. The GPC is aiming to remove burden of indemnity from all NHS GPs and practice staff and establish parity with hospital doctors. As described previously discussions with the DH have already started. Problem: Workload and demand has rapidly grown over last decade, the population is increasing, underfunded workload has been shifting from hospitals, bureaucracy of regulatory reporting has increased significantly. Impact: Doctors leaving or not joining general practice, practices suspending patient registrations or closing, GP burnout. It is in the interest of everyone for practices to improve quality and safety, and address recruitment and retention crisis, and part of this must be by agreeing safe workload limits. Work is ongoing to try and provide practices with practical tools with which to achieve workload control. The GPC is working on guidance on safe working limits, by number and type of appointment. Access to general practice is a priority for the Government. There have been initiatives such as extended opening at practice level, this was promptly followed by the Prime Minister's Challenge Fund which invested in the development of centres (hubs) that we able to offer access from 8am to 8pm 7 days a week. These have now evolved to the Extended Access Schemes which are worth about £6 per patient (weighted). These Hubs are often run by groups of practices or GP Federations (GP provider companies). The aim is to develop these clinical hubs and create the ability to transfer work when practices are at capacity. This means we must build on GP Access fund and urgent care plans that are being discussed locally. The hospital have a system that means when they have reached a certain level they can declare a "Black Alert" to let the system know they are under significant pressure. General Practice needs a similar system and there will be different levels depending on severity, prompting local action to reduce pressure. Discussions are progressing on how this could work. Problem: Threat of APMS and ACO contracts, doctors unwilling to commit to becoming partners due to uncertainty, impacting recruitment, retention and premises developments. Progress: Investment in GMS contract through national negotiations; Secretary of State speaking of commitment to partnership model; The BMA has produced ACO contract guidance; The Government is committed to a review of ACOs. Problem: There is insufficient investment, we are seeing a deterioration in premises, some are out of date/not fit for purpose, some experience slow IT networks, outsourcing NHS backroom function problems for example is the service charge in some leased premises. The GPC has conducted a Survey of GPs, the Wessex LMC area was the largest contributor to this survey, so many thanks to all the practices who submitted evidence. Many practices have still not had their delayed payments resolved and there is some evidence that the service has declined further. I am aware that my practice is still owed about £30,000 of delayed payments of which some go back over 12 months. One practice recently contacted the LMC as it was owed over £100,000. These sort of figures are sums that individual Practices are unable to to manage. The new EU Data Protection Regulations (GDPR) will come into effect from May 2018. The UK data protection bill is currently going through parliament so there may be potential for more changes. This was clearly a tragic case for the family of the young boy who sadly died. I have read a lot about this specific case and there has been a significant amount of speculation about the events that led to death of this child and responsibility of the individual doctor and also the proceedings that have taken place since. This doctor was convicted of manslaughter by gross negligence and given a 2 year suspended sentence. A Medical Practitioners Tribunal (MPTS - see below for more information) decided in June 2017 to suspend the doctor for 12 months rather than erase her from the register, after taking account of system failures that contributed to the death of this child. The GMC appealed the Tribunal's decision and the Court of Appeal have substituted the sanction of erasure, after the General Medical Council appealed. There are clearly issues about our individual responsibilities to our patients as a doctor but there are wider issues about the part the system plays when services are under extreme pressure and there are inadequate staffing levels. The BMA is leading on work in this area. The area I wanted to focus on was appraisals and the use of reflection to both learn from, and to ensure a safer service for the future. It has been stated that in this case the doctor's reflections on this tragic death were used by the court to support the prosecution of this doctor. This statement is incorrect, the Court did not ask for this information but this was submitted as evidence by the defense Barrister at the Court of Appeal. My personal view has always been that a Court has the power to demand the disclosure of documents and refusal to do so would result in an individual being in contempt of Court. Appraisals therefore should remain and important an valuable part of our development and this should be a time where two colleagues can, in a safe environment, discuss a number of issues that pertain to that individuals clinical practice. Part of this will be based on the the events that have happened, including significant events. We must continue to learn from these events. Clearly all doctors are going to be cautious about the details they record. Anything you write whether that be in an email, a document or in an appraisal folder could be used in Court and therefore it is always worth being mindful of what you write. I have seen comments that doctors should stop engaging in appraisal, or refuse to record reflection - in my view that would be the wrong action to take and would be counter productive. MPTS - They are the adjudication function for UK doctors. They protect patients by making independent decisions about a doctor’s fitness to practise, measured against professional standards set by the GMC. They have powers to impose sanctions on a doctor’s practice, where necessary, to protect the public. The MPTS was established in June 2012 to provide a clear separation between the GMC’s investigation function and the adjudication of hearings they are funded by the GMC and report to GMC Council twice a year. They also report to Parliament on an annual basis. 1. Ensure that everything you write is couched in professional and neutral terms. Think professional, not confessional and avoid being judgemental of yourself or others. For sensitive matters it may help to draft your initial thoughts separately and then distill these into your written reflection. 2. Diligent anonymisation of all written material in appraisal is as important for the writer as for others. It is essential to ensure that third parties, be they patients or colleagues, cannot be identified. 3. Talk before you write. If unsure what to write on a sensitive topic, make a non-specific reference in your appraisal submission as a reminder to discuss it at your appraisal. You can then agree with your appraiser what to record in the appraisal summary. Reflecting on practice as described in GMC guidance is an essential aspect of professional life for a doctor. When making written reflection of sensitive matters at appraisal a doctor needs to find a sensible professional balance, to provide evidence of effective reflection whilst avoiding inappropriate over-sharing. Limits are placed on access to information written for appraisal under most circumstances. Every designated body is expected to have their own medical appraisal documentation access statement, setting out these. The access statement for NHS England can be found at the link below. A doctor unsure about whether to cooperate with a request to disclose appraisal reflections or other documentation to any party may seek advice from a number of sources, such as their appraiser, local Caldicott guardian, responsible officer, medical defence organisation, professional (e.g. BMA) or legal representative. The NHS has been very clear that any patient identifiable information must be sent by encrypted email and for the NHS this should be nhs.net to nhs.net. It has always seemed rather odd that locum GP were not permitted to have an nhs.net email address. It is expected that this issue will be resolved shortly. The LMC has been working closely with the GPC on this issue. Dr Gareth Bryant, Deputy CEO at Wessex LMCs and a GP in Wiltshire represents local LMCs on a National Board that is monitoring the GPFV. There has been a focus on the transformation funding for general practice. This is £3/patient to be invested over 2017/8 and 2018/9. The LMC has been meeting with CCGs and making sure that this money is real and is made available to transform services. The LMC is compiling a comparison across all our CCGs of the amount invested and services delivered. The GPC has done an FOI request of all CCG to look at transformation funding for 2017/8 and 2018/9. Many practices are reporting that they have not seen any additional money in their practice. The GPFV was a package that committed by 2020/21 would be worth £2.4bn each year. Estates Technology Transformation fund (ETTF) - About £900m was committed to estates and technology - we do have a number of schemes planned and these are not without a degree of difficulty but inevitably, this will only impact a small number of practices. Improved Access - there is £138 million available in 2017/18 to support better access, CCGs with GP Access Fund sites will receive £6 per weighted patient in 2017/18 and 2018-19 and this includes in our area, Hampshire and the Isle of Wight with other areas added over the next couple of years. All CCGs will receive £3.34 per head in 2018/19 to start to establish the service. From 2019/20 all CCGs will receive £6 per head. It is essential that these services are implemented in a way that they support general practice and add capacity to a system under strain. The money must not be used as a way of paying for out of hours or the NHS 111 service. The funding is not intended for individual practices but could be bid for by groups of practices working together. Training - the LMC has been at the forefront of developing Practice Manager training through Wessex LeaD (the LMC's education and training service) and I am pleased to report that we have secured a significant amount of funding from NHS England to further develop and support our programme for Practice Managers. The national budget for this year is £2.5m for Practice Managers and £10m for admin and clerical staff. Other training that has been made available such as those relating to the 10 high impact action - click here for more information. The one area that many practices have found helpful is the document workflow. I know from my practice that we have reduced the documents going to individual GPs by about 70% which makes a small but significant difference to your daily workload. Online consultations - £15m will be invested over the next 12 months. Most of Hampshire are now using e-Consult (formerly known as Web-GP) and Dorset are currently in the middle of a procurement of an online consultation product. The products are helpful for both self care and the online method of consultation. The more the Practice makes this part of their systems and embraces the potential the greater the impact it will make. Online Consultations will have little impact unless actively promoted to patients and fully embedded into the practice. 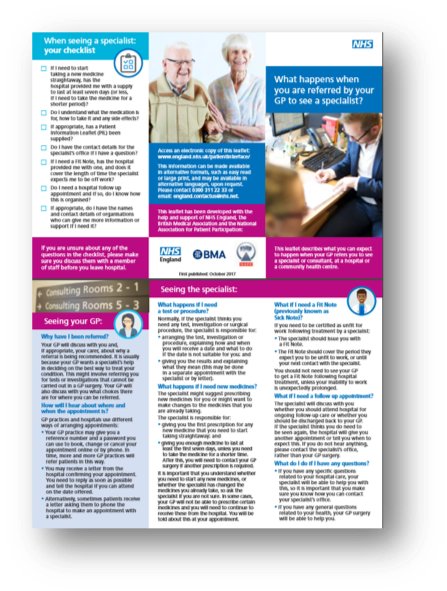 GP retention scheme - also known as the retainer scheme, this is aimed at retaining older doctors as well as keeping younger doctors in the workforce when they have young children etc. Practices employing a GP in this scheme will receive £76.92 per session and the GP will receive £1000 per session towards expenses, up to a maximum of 4 sessions a week. Mental health therapists - there will be 1 WTE per 30,000 therapist based in Practices - this will equate to a total of 3,000 therapists across the country - there are 20 mental health pilots, 400 new IAPT therapists in primary care -. None of the pilots as far as I am aware are in Wessex. Clinical Pharmacists - So far 583 have been appointed, 587 more agreed - practices employing Clinical Pharmacists will receive £29,000 FTE (£36,000 FTE Senior CPs) which reduces to £0 over three years. The LMC is very supportive and has seen the value of having a Pharmacist based in a Practice. They make a significant contribution to quality and safety and can reduce the overall drug budget and therefore help the patients of the Practice and the system as a whole and therefore the LMC's view is when we need to make Practices more resilient, add capacity and reduce the overall NHS costs - these posts should be fully funded and not have tapering funding with the costs being sequentially transferred to the Practice. Resilience - a significant number of Practices have received funding from the Resilience Initative. Practices are then able to undertake a diagnostic review of their Practice and enables them to secure external help to survive by developing their organisation. There are more Practice mergers taking place in Wessex than most other areas and the Resilience Funding is being invested in Practices to help them merge and to work at scale. There was £8m invested in England in 2017/8. The development of the out of hospital model, working at scale is not only critical to the future of the NHS but also to general practice, we must ensure this supports general practice and "backs into Practices" and is not simply seen as a hospital facing support mechanism to stop patients going into hospital. The LMC has been successful in securing national funding to deliver a GP Supporter Programme whereby we can partially fund experienced GPs to help Practices in difficulty. More information will be shared in the next couple of weeks. The BMA are not promoting any particular model, but can offer support to interested practices. Greater influence - a Practice of 30,000 will have greater influence that 5 separate Practices of 5,000 patients. Federations - these mean different things to different people. We should probably change the title to networks, where Practices are working together in a loose association and a GP Provider Company where there is a legal structure and the organisation has the ability to hold a contract and deliver services at scale to support their Practices. Super Partnerships - These are now more common than single handed GPs and the numbers of Practices evolving into Super Partnerships is accelerating. Practices forming a single business unit, covering multiple sites. Primary Care Home (PCH) - there are over 220 of these in England and more developing in Wessex as a model that is seen to support local communities. New Models of Care - these were the corner stone of the transformation that was described in the Five Year Forward View - in Hampshire there were 3 Vanguard Pilots that formed part of the New Models of Care - NE Hampshire and Farnham (which was a Primary and Acute Care System (PACS), Isle of Wight (again a PACS model ) and the rest of Hampshire which was a Multi Specialty Community Provider (MCP). The 3 year pilot is now coming to an end. The LMC has been very involved in the New Models of Care as this has been seen as a way of supporting general practice and developing new ways of working that mean the focus is not just about hospitals. After 3 years there is a major question to be answered about what has been achieved? Same day access Centre in Gosport (4 practices working together with support from community services). Creation of a common shared clinical record in the Primary Care Access Hub - any patient seen, the clinician is able to see the patient's complete practice record. Enhanced recovery at home service – based in NE Hampshire and Farnham, to help people continue their recovery at home once they’ve left hospital, or to stop the most vulnerable patients from needing to go into hospital. Frailty service - recently been commissioned in the New Forest - a service to support Practices to look after people from those "going off their legs" to "acute confusion" to trying to prevent hospital admissions. Integrated care – New teams have been set up who are made up of GPs, mental health workers, social workers, nurses and eventually hospital consultants. These teams meet weekly to review the status of their most vulnerable patients and to take proactive action to make sure that they are happy, healthy and at home. This has been an aim of all the Vanguards locally but only been achieved by NE Hants and Farnham. Fully funded Practice based Pharmacists in the New Forest, working together and with community and hospital Pharmacists. Practices who were unable to recruit and were in a difficult position now formed into a group of 4 Practices and have changed their status to one of employed GPs, their building and staff are now the responsibility of the Community Trust. Recovery College Model – is a programme in NE Hampshire and Farnham that provides courses which focus on living with and living beyond a mental health condition, or chronic physical condition. East Hampshire - Wessex Academic Health Science Network (AHSN) is working with Badgerswood Surgery in Bordon to test a new way of monitoring patients’ vital signs. The LifeLight® system can check a patient’s vital signs - their pulse, breathing rate, blood pressure and blood oxygen level - by simply sitting in front of a computer screen, click here for more information. Improved COPD diagnosis and care -Two surgeries are working with specialists from Portsmouth to identify patients suffering from Chronic Obstructive Pulmonary Disease (COPD) and deliver appropriate care in their own GP surgery. The project, known as MISSION (which stands for Modern Innovative Solutions in Improving Outcomes iN COPD), identifies local patients with a history of breathlessness, recurrent chest infections (e.g. needing frequent antibiotics and steroid prescriptions) and offering them a full day of specialist assessment, education and self-management skills all at their GP surgery. Click here for more information. These are just a few examples and demonstrate what can be achieved if Primary Care is supported and when motivated GPs work with good Managers. None of this can be achieved without funding, but the amount invested to achieve this compared to the total NHS budget and the potential return on investment, is relatively small. The big question is what happens next? The Vanguard programme finishes in April - do we lose all the innovation and gains or do we make these a foundation to build on and make Wessex a better place to work? It must be clear to everyone that the NHS is under considerable strain and as our population gets older and more people have long term conditions that pressure will only increase. The current trend of investment in hospitals at the expense of general practice and community services is not sustainable. The NHS has to invest more in the community and general practice, services need to be more efficient and more effective and this can only be achieved by organisations working more closely together. There was an expectation that by 2019 the NHS would start to commission services not by organisation with activity as the major factor, to a population based contract with defined outcomes and this contract would be held by an organisation that was a combination of general practice, community services, social care and some traditional hospital based services, the contracts would be for 10-15 years and called MCP or PCAS Contracts. The first stage to reach this goal is for organisations to work together, collaborate and start taking some joint responsibility for the healthcare system they work in. This has been described as an Accountable Care System (ACS) and does not only included providers but also includes commissioners. If you move to a single contract for a defined population you would need to have an Accountable Care Organisation (ACO) or an Accountable Care Partnership (ACP) and we are still some way off creating this type of organisation. Inevitably GPs and Practices are concerned about the implications of an ACS or an ACO. Does an ACS mean we have to give up our contract and become salaried? Absolutely not, currently general practice is often missed when funding is available or major decisions are made. We want to have a seat at the table and be able to influence services. The NHS has struggled to work out how to engage general practice over a large population but we are slowly changing that, some emerging ACSs in Wessex have got seats on the evolving Board for the LMC,w representing GPs and Practices as providers, a representative of the GP Provider Companies, who provide non GMS services at scale and some will have CCG GPs who are representing the commissioners. General Practice can play an important role in an ACS or ACO and still retain its contract and the independent contractor status. That is why the virtually and partially integrated model was developed. Are Practices at risk if they join and ACS or ACO, because if that organisation is overspent the impact on GP income will be devastating? No, because the way the organisation is established can only include general practice if practices agree to be part of it. The LMC and GPC have been representing GPs views and explaining that practice income needs to be ring fenced if they form part of one of the joint ventures. Will general practice get a say in an ACS or ACO? Yes, we are looking for parity with our hospital and community colleagues. We want to be able to influence services and ensure there is greater investment in the community. Is this the first step to privatisation? This is a major concern, if you put a number of services together in a single organisation and then put these services out to tender than the private sector would be awarded the contracts. It is clear that the private sector has things it can offer the NHS and become a partner in organisations and services but largely the return on investment (AKA Profit) is normally insufficient for the private sector. Experience with large scale Public Sector contracts such as Capita or Corrilian have not shown there are significant profits to be made. I think most GPs would like us to have a seat at the table, have influence, but not put our contracts at risk. NHS England and NHS Improvement recently published joint guidance, setting out the expectations for commissioners and providers in updating their operational plans for 2018/19. Section 3 in the appendix covers primary care and in particular the focus on CCGs delivering on their proportion of the GP Forward View funding, the earlier roll-out of the extended GP access coverage before next winter and an instruction to actively encourage every practice to be part of a local primary care network, with the aim of ensuring there is complete geographically contiguous population coverage of primary care networks as far as possible by the end of 2018/19. The guidance is available here . The Department of Health and Social care has published its response to their Availability of gluten-free foods on NHS prescription consultation. It has been decided to retain a limited range of bread and mix products on prescription, which means that gluten free foods from the following categories will no longer be available for prescribing; biscuits, cereals, cooking aids, grains/flours and pasta. The GPC would expect those CCGs that have already attempted to stop all prescribing of gluten free foods to amend their policy in line with this document, and would encourage them to introduce schemes that allow for the supply of these items without the need for GPs to write prescriptions. You can read the BMA’s response, led by the GPC’s prescribing policy group, here. Over the last 10 to 15 years there has been a growing sessional GP workforce (sessional GP means salaried, employed and locum GPs) with a decline in the number of GP Partners. In the last 3 years the LMC has observed that practices have found it increasingly difficult to recruit Partners and it has been easier to recruit Salaried GPs. This trend is changing and we are now seeing more GPs, including the younger GPs wanting to be Partners. In some areas recruitment remains extremely difficult but we are seeing other areas where recruitment is getting better. I am often told that the Sessional GP workforce accounts for 50% of the total number of GPs, this is certainly a figure that the LMC does not recognise and does not reflect the % of Partners vs Sessional GPs on our database. I believe some parts of the country, such as London does have a much higher % of Sessional GPs. Latest figures show that there are 33,300 WTE GPs working in England, of these 20,300 (61%) are Partners, 8,600 are Sessional GPs, 4,500 are GP Trainees and the rest are Retainers. In 2002 a WTE GP Partner earned about £75,000 before tax, this peaked in 2005/6 at £113,000 and since then has fallen to £104,000 in 2015/6. Although workload and complexity are the two major factors in difficulty with recruitment and retention in general practice, there is no doubt the fall in income in real teams associated with a rising demand will have a major impact.